Visual inspection of the transformer exterior reveals important condition information. For example, valves positioned incorrectly, plugged radiators, stuck temperature indicators and level gauges, and noisy oil pumps or fans. Oil leaks can often be seen which indicate a potential for oil contamination, loss of insulation, or environmental problems. Physical inspection requires staff experienced in these techniques. Check all temperature indicators while the transformer is online. The winding temperature indicator should be reading approximately 15 degrees above the top oil temperature. If this is not the case, one or both temperature indicators are malfunctioning. Check the top oil temperature next to the top oil indicator’s thermowell with an infrared camera. Compare the readings with the top oil indicator. Reset all maximum indicator hands on the temperatures indicating devices after recording the old maximum temperature readings. High temperature may mean overloading, cooling problems, or problems with windings, core, or connections. When the transformer is offline and has cooled to ambient temperature, check the top oil and winding temperature indicators; both should be reading the same. If not, one or both temperature indicators are malfunctioning. Check the calibration according to the proper procedure. Also compare these readings with the indicated temperature on the conservator oil level indicator; all three should agree. Check the oil level gauge on the conservator. See figure 1 at right. This gauge indicates oil level by displaying a temperature. Compare the indicated temperature on the conservator level gauge with the top oil temperature indicator. They should be approximately the same. Calibrate or replace the conservator oil level indicator if needed, but only after checking the top oil temperature indicator as shown in the above section. Reference also IEEE 62-1995™ , section 6.6.2. If atmospheric gases (nitrogen, oxygen, carbon dioxide) and perhaps moisture increase suddenly in the DGA, a leak may have developed in the conservator diaphragm or bladder. With the transformer offline and under clearance, open the inspection port on top of the conservator and look inside with a flashlight. If there is a leak, oil will be visible on top of the diaphragm or inside the bladder. Reclose the conservator and replace the bladder or diaphragm at the first opportunity by scheduling an outage. If there is no gas inside the Buchholz Relay, the transformer may be re-energized after bleeding the air out of the bladder failure relay. A DGA should be taken immediately to check for O2, N2, and moisture. 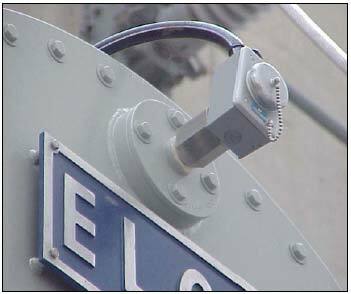 However, the transformer may be operated until a new bladder is installed, keeping a close eye on the DGAs. It is recommended that DGAs be performed every 3 months until the new bladder is installed. After the bladder installation, the oil may need to be de-gassed if O2 exceeds 10,000 ppm. Also, carefully check the moisture level in the DGAs to ensure it is below recommended levels for the particular transformer voltage. Check the desiccant in the breather often; never let more than two-thirds become discolored before renewing the desiccant. All efforts should be made to keep the oxygen level below 2,000 ppm and moisture as low as possible. Check the dehydrating (desiccant) breather for proper oil level if it is an oil type unit. Check the color of the desiccant and replace it when approximately one-third remains with the proper color. See figure 2 for a modern oil type desiccant breather. 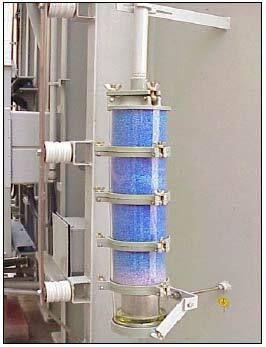 Notice the pink desiccant at the bottom of the blue indicating that this portion is water saturated. Notice also that oil is visible in the very bottom 1-inch or so of the unit. Many times, the oil is clear, and the oil level will not be readily apparent. Normally, there is a thin line around the breather near the bottom of the glass; this indicates where the oil level should be. Compare the oil level with the level indicator line and refill, if necessary. Note the 1¼-inch pipe going from the breather to the conservator. Small tubing (½ inch or so) is not large enough to admit air quickly when the transformer is de-energized in winter. A transformer can cool so quickly that a vacuum can be created from oil shrinkage with enough force to puncture a bladder. When this happens, the bladder is destroyed; and air is pulled into the conservator making a large bubble. If the transformer has a nitrogen blanket, check the pressure gauge for proper pressure. Look at the operators recording of pressures from the pressure gauge. If this does not change, the gauge is probably defective. Check the nitrogen bottle to insure the nitrogen is the proper quality (see PEB No. 5 ). Check for any increased usage of nitrogen which indicates a leak. Smaller transformers such as station service or smaller generator-step-up transformers may not have nitrogen bottles attached to replace lost nitrogen. 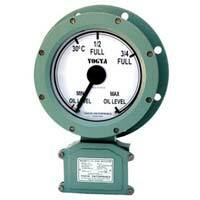 Be especially watchful of the pressure gauge and the operator’s records of pressures with these. The pressure gauge can be defective for years, and no one will notice. The gauge will read nearly the same and will not vary much over winter and summer or night and day. Meanwhile, a nitrogen leak can develop; and all the N2 will be lost. This allows air with oxygen and moisture to enter and deteriorate the oil and insulation. Watch for increased oxygen and moisture in the DGA. An ultrasonic and sonic leak detection instrument (P-2000) is used for locating N2 leaks. Check the entire transformer for oil leaks. Leaks develop due to gaskets wearing out, ultraviolet exposure, taking a “set,” or from expansion and contraction, especially after transformers have cooled, due to thermal shrinkage of gaskets and flanges. Many leaks can be repaired by applying an epoxy or other patch. 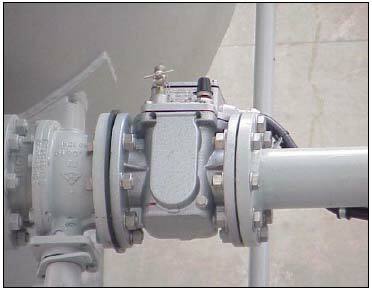 Flange leaks may be stopped with these methods using rubberized epoxy forced into the flange under pressure. Very small leaks in welds and tanks may be stopped by peening with a ball-peen hammer, cleaning with the proper solvent, and applying a “patch” of the correct epoxy. Experienced leak mitigation contractors whose work is guaranteed may also be employed. Some leaks may have to be welded. Welding may be done with oil in the transformer if an experienced, qualified, and knowledgeable welder is available. If welding with oil in the tank is the method chosen, oil samples must be taken for DGA both before and after welding. Welding may cause gases to appear in the DGA and it must be determined what gases are attributed to welding and which ones to transformer operation. With the transformer under clearance, check the pressure relief device indicating arm on top of the Figure 3.— Pressure Relief Device. transformer to see if it has operated. If it has operated, the arm will be in the up (vertical) position, and alarm and shutdown relays should have activated. Do not re-energize a transformer after this device has operated and relays have de-energized the transformer, until extensive testing to determine and correct the cause has been undertaken. Explosive, catastrophic failure could be the result of energization after this device has operated. If the transformer has oil pumps, check flow indicators and pump isolation valves to ensure oil is circulating properly. Pump motor(s) may also have reversed rotation, and flow indicators may still show that oil is flowing. To ensure motors are turning in the proper direction, use an ammeter to check the motor current. Compare results with the full-load-current indicated on the motor nameplate. If the motor is reversed, the current will be much less than the nameplate full-load-current. Check oil pumps with a vibration analyzer if they develop unusual noises. Have the DGA lab check for dissolved metals in the oil and run a metal particle count for metals if the bearings are suspect. This should be done immediately, as soon as a bearing becomes suspect; bad oil-pump bearings can put enough metal particles into the oil to threaten transformer insulation and cause flashover inside the tank. An explosive catastrophic failure of the transformer tank could be the result. Inspect all isolation valves at the tops and bottoms of radiators to ensure they are open. Inspect cooling fans and radiators for cleanliness and fans for proper rotation. Check for dirty or damaged fan blades or partially blocked radiators. Fans are much more efficient if the blades are clean and rotating in cool air. Normally, fans blow cool air through the radiators; they should not be pulling air through. Check to see if fans are reversed electrically (i.e., pulling air first through the radiators and then through the fan blades). This means the blades are rotating in warm air after it passes through the radiator which is much less efficient. Place a hand on the radiator opposite the fans; air should be coming out of the radiator against your hand. Watch the blades as they rotate slowly when they are starting or stopping to determine which way they should be rotating and correct the rotation if necessary. Inspect the isolation valve on the Buchholz relay to ensure it is open. With the transformer offline and under clearance, examine the Buchholz relay by lifting the window cover (center in figure 4 at right) and looking inside. If there is gas inside, the oil will be displaced, and the gas will be evident as a space on top the oil. 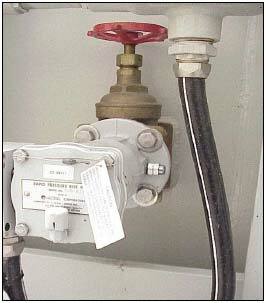 If sufficient gas is found to displace the upper float, the alarm should be activated. The small valve at the top left is to bleed the gas off and reset the relay. If a small amount of gas is found in this relay when the transformer is new (a few months after startup), it is probably just air that has been trapped in the transformer structure and is now escaping; there is little cause for concern. If the transformer has been on line for some time (service aged), and gas is found in the Buchholz, oil samples must be sent to the lab for DGA and extensive testing. Consult with the manufacturer and other transformer experts. A definite cause of the gas bubbles must be determined and corrected before re-energization of the transformer. An example relay is shown in figure 5 at the left. 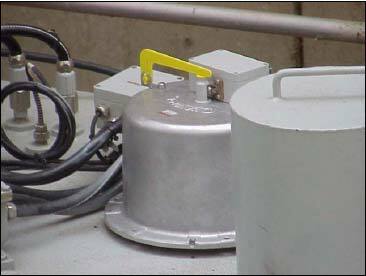 The purpose of this relay is to alarm if there is a sudden pressure rise inside the tank. This relay is very sensitive and will operate if the pressure rises only a little. If a very small pressure change occurs caused by a small electrical fault inside the tank, this relay will alarm. In contrast, the pressure relief device (shown above in figure 5) operates if a large pressure builds inside the tank caused by heavy arcing and heating causing the oil to boil and bubble. Inspect the isolation valve to ensure it is open. With the transformer offline and under clearance, functionally test the sudden pressure relay by slowly closing the isolating valve. Leave it closed for a few seconds and reopen the valve very suddenly; this should activate the alarm. If the alarm does not activate, test the relay, and replace it with a new one if it fails to function. On newer transformers, a bladder failure relay may be found on or near the conservator top on the oil side of the bladder. This relay is near the highest point of the transformer. Its purpose is to alarm if the bladder fails and admits air bubbles into the oil. The relay will also serve as a backup to the Buchholz relay. If the Buchholz relay overfills with gas and fails to activate an alarm or shutdown, gas will bypass the Buchholz and migrate up into the conservator, eventually to the bladder failure relay. See figure 6. Of course, these gases should also show up in the DGA. However, DGAs are normally taken only once per year, and a problem may not be discovered before these alarms are activated. If the bladder failure alarm is activated, place the transformer under clearance and check the Buchholz for gas as mentioned in section 1.10. Open the conservator inspection port and look inside with a flashlight to check for oil inside the bladder. Bleed the air/gas from the conservator using the bleed valve on top of the conservator. If the transformer is new and has been in service for only a few months, the problem most likely is air escaping from the structure as mentioned in section 1.11. With the transformer under clearance, open the inspection port on top of the conservator and look inside the bladder with a flashlight. If oil is found inside the bladder, it has developed a leak; a new one must be ordered and installed. Do you think this can be enough informations for technicians to visually inspect oil transformer? It depends on transformer condition. I had few very hard to detect problems with ABB's oil transformers 1600kVA. Of course it has a lot with transformer state. What problems did you have with ABB’S transformers? You didn’t mention rated primary voltage. After few years and bad or non-at-all inspections ANY oil transformer can became unstable in work or show some more or less serious problems. hey guys do you think we can notice the level of transformer oil without visual inspection?